The six-colour JAVELIN printer is a production scanning printer that uses SPGPrints’ unique Archer technology and Fujifilm Dimatix Samba print heads to fire variable drops of ink (2-10 pL) up to 4mm to the substrate. With an output of up to 367 linear metres per hour, the JAVELIN is suited for medium output levels, and situations where more frequent changes between different fabrics and ink chemistries are required. For higher volumes, information will be available on the stand about the SPGPrints PIKE® printer that offers high-speed, single-pass production using the same proven Archer technology. Capable of speeds up to 40 linear metres / hour, PIKE is enabling users to offer lead times of less than one week to global fast-fashion brands, for orders exceeding 100,000 linear metres. In addition to production flexibility, the JAVELIN and PIKE printers deliver high-quality print with fine lines, solid blotches, precise geometrics, and micro patterns, making them ideal for today’s design trends and demands for fast-fashion. SPGPrints manufactures its own inks for use with JAVELIN and PIKE printers at its recently-expanded ink plant at its headquarters in Boxmeeer. SPGPrints’ NEBULA® range of digital inks is designed for use with printers using Kyocera print heads. Acid, reactive, disperse and sublimation inks are available, and assure smooth running, wide colour gamuts, and outstanding quality with low maintenance. SPGPrints continues to lead the way in innovation for screen technologies because it recognises the complementary nature of digital and screen production in meeting the demands of today’s markets quickly and cost-effectively. 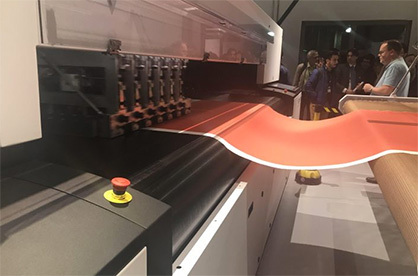 On its stand at ITM 2018, visitors will find a selection of screens and printed textiles that demonstrate the characteristics of the NovaScreen® line-up. NovaScreen screens offer relatively high open areas thanks to a mesh counts with minimum spacing between holes, maximising paste transfer, and are available in a range of meshes from 135 and 245 holes per linear inch. This results in higher printing speeds and paste yields. The robust nickel construction of NovaScreen offers stability at high speed, long life and easy handling. The NovaScreen 245 mesh offers exceptional definition and resolution. With hole-sizes of 40 microns, it features an exceptionally high mesh count. This gives it two important quality advantages: first, it prints perfect halftones and tonal gradations, with transitions not previously possible with rotary screen printing. Fine rasters that generate homogenous shade impressions on the printed substrate make this possible. Fine linework and smaller dots can also be reproduced, enabling greater creativity in geometric patterns and halftones for fashion and interior décor applications. Also on the stand will be SPGPrints’ RandomScreen®, a 125 mesh has a 79-micron hole-size screen, that supresses moiré effects in halftones. The holes are arranged stochastically, out of line with each other, thereby eliminating the risk of undesired patterns becoming visible in printed results. RandomScreen also can save paste, especially when pigment printing. To achieve the best results from SPGPrints’ NovaScreen line, direct laser engraving, and laser imaging solutions can cut screen preparation times, accelerate throughput and increase productivity. Information about these laser engraving systems will be available at the stand. The SPGPrints bestLEN offers state of the art direct laser engraving for effortless, repeatable quality in screen imaging. Direct laser engraving is a single-step dry process: simply engrave the desired design and print. This eliminates costly consumables such as film, ink or chemicals, and time-consuming processes like exposing and washing. SPGPrints’ smartLEX 7430 laser exposing system uses unique multi-beam diode technology that combines long lifetime, high productivity and resolutions of up to 2540dpi. smartLEX 7430 exposes screens between 300mm and 3500mm length. Exposing cycles can be as short as 12 minutes, and intuitive, easy-to-use, Smart-GUI software requires relatively little experience to master.